Why don't banks lend to Egypt's private sector? The World Bank's Economic Policy, Poverty and Gender council released a report about what stops banks from helping the private sector in Egypt. The 2012 AUC Research Conference for Entrepreneurship and Innovation: Shaping the Future of Egypt, offers solutions. 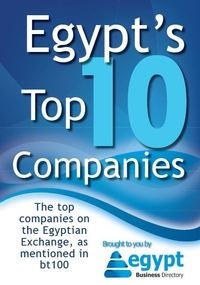 The World Bank's newest Trade Logistics Report, where Egypt is placed number 57 worldwide, up from number 92 in 2010 and 97 in 2007. When talking about the economy, it is not about "What would Jesus do? ", but "What would the United States do?". Egyptian tax laws are subject to change frequently, and this is the latest version of laws available. A summary of the findings of the Expert Consultation Meeting on Wastewater Management in the Arab World, convened in Dubai in May 2011. This report reviews the opportunities and challenges involved in improving energy efficiency and developing renewable energy resources in Egypt. Consumers in Egypt spent close to 8 billion Egyptian Pounds on salty snacks, sweets and other treats last year. Mohamed Tohami, bestselling author & motivational speaker, helps unfulfilled professionals connect their passion to a profitable path. Economic growth alone is not enough to create cities considered genuinely important by the world’s wealthiest people. North African industry has experienced the fallout associated with Chinese competitiveness in manufacturing within their domestic market. The term social media is intended to contrast the centralized mass media with the decentralized media of Twitter, Facebook and the like. Making Egypt’s education system more effective and more equitable will be of critical importance to the success of Egypt’s transition. A paper focusing on aspects of Egypt’s economic policy in the transitional period, paying particular attention to social justice and job creation. Shedding light on the political budget cycles in Egypt seems very timely as the country is undergoing a prolonged process of democratic transition.